There is considerable disagreement with regard to the magnitude of cash remittances to Cuba. Such a controversy is not unique to Cuba, as the issue is similarly debated in other countries that receive substantial remittance inflows. In the case of Mexico, for example, the results of a recent academic study questioning the magnitude of remittance estimates have been challenged by critics claiming it has political undertones. Its intent, critics allege, is to cast a more positive glow on President Fox’s anti-poverty policies, when in fact poverty declines in Mexico are associated with growing remittances from Mexicans abroad to relatives at home (Malkin 2005). Comparable controversies, as we note below, surround the remittance issue in Cuba. In a recent report on Cuban economic development and prospects, the United Nations Economic Commission for Latin America (Comisión Económica para América Latina y el Caribe, CEPAL) estimated that remittances to the island from residents in the United States amounted to $900 million in 2003, roughly 3% of the country’s gross domestic product, further stating that such remittances “had determinative influence on the country’s financial stability and on the level of consumption of households” (CEPAL 2004, p. 2). Meanwhile, a large survey of individuals in the United States that send money to friends and relatives in Cuba conducted in February 2005 found that they remitted about $460 million per annum (Bendixen 2005), or roughly half of the amounted estimated by CEPAL. • Finally, a U.S.-based researcher (Betancourt 2000) has argued that the very high estimates of remittances (in the $800 million to $1 billion per year range in the late 1990s) are not consistent with the capacity to remit of the Cuban- American community abroad and actually hide foreign exchange that flows illegally to Cuba from drug trafficking and/or money laundering. The purpose of this paper is to survey different methods that have been used to estimate remittances to Cuba. In particular, five approaches—and their applications to Cuba—are discussed: (1) estimates from balance of payments data; (2) estimates based on information culled from remittances senders; (3) estimates based on information culled from remittances recipients; (4) ad hoc estimates by Cuban scholars; and (5) estimates of the capacity of migrants to remit. To the extent possible, the magnitude of remittances derived from each approach is compared to determine consistencies and potential sources of differences. Most nations of the world collect and publish annual statistics on their money receipts from abroad (inflows) and payments to persons or entities abroad (outflows) using a framework developed by the International Monetary Fund (IMF) in the 1940s called the balance of payments (BOP). Among the receipts from abroad recorded in BOP statistics are income earned from exports of goods and services, income earned from foreign investments abroad, and transfers from abroad such as foreign aid and family remittances. Payments recorded in BOP accounts include loans received from abroad and foreign investment. Table 1 presents Cuban BOP statistics for the period 1993–2001 compiled from the official statistical yearbook, Anuario Estadístico de Cuba (AEC).6 It is readily observable that the BOP statistics are highly aggregated (for example, no breakdown of income flows to differentiate among interest, dividends, or profits). For the purpose of this paper, the most significant weakness of official Cuban BOP statistics is that they do not break down current transfers into their constituent parts. • general government transfers, which includes subsidies and grants to current budgets; gifts of food, clothing, medicines, etc. ; gifts of military equipment that has no civilian uses; technical assistance; indemnities imposed under peace treaties (reparations); government contributions to the budget of international organizations; and scholarships given to citizens in a foreign country. • other sectors transfers, which consist primarily of workers’ remittances, that is goods or financial instruments transferred by migrants living and working abroad to residents of the economies where the migrants formerly resided. An import caveat is that workers’ remittances include only those transfers made by workers who stay in foreign economies for at least one year, i.e., they are migrants; workers who remain in a foreign country less than one year are not considered as residents of the foreign economies and their remittances to the home country represent transfers of labor income earned rather than remittances, and are recorded elsewhere in the BOP framework. Finally, if a migrant is self-employed in a foreign country, his or her remittances abroad are considered as current transfers but are not counted as workers’ remittances since they arise from entrepreneurial activities rather than labor. Returning to Table 1, Cuban official BOP statistics report that current transfers rose from 263 million pesos in 1993 to 646 million pesos in 1995 (146% increase), peaking at 813 million pesos in 1998; current transfers fell slightly in 1999 (to 799 million pesos) and in 2000 (to 740 million pesos) and recovered in 2001 to 813 million pesos. Methodological notes in Cuba’s statistical yearbook indicates that current transfers include “donations, family remittances, etc.” (AEC 2003). Unknown is which portion of the current transfers are donations and which portions represent family remittances and other forms of transfers. Of particular significance here is how expenditures in Cuba by emigrants visiting their families are recorded, and whether or not these expenditures are segregated from those of other foreign visitors (e.g., tourists). This is not an inconsequential distinction as Cuban emigrants returning for visits, and bringing cash remittances with them, are assumed to be (see below) an important source of money transfers, not only for their direct expenditures, but for the dollar transfers they provide to relatives and friends. The significance of these direct transfers cannot be overestimated as they have a magnified net impact since they bypass customary transfer payments that may range anywhere from 7% (e.g., wire transfers) to 20% (for the services of the fastest and most reliable mulas, or informal money couriers), depending on the transfer channel used. Restrictions imposed by the Bush Administration in 2004 that have brought about a 60% decline in the number of Cuban-American travelers to the island are believed to have cost Cuba by mid-2005 close to $100 million (Cancio Isla 2005). How much of this loss can be attributed to a diminution in remittance flows is unknown, but the amount could be substantial particularly if some of the visitors were mulas no longer able to enter Cuba at will. CEPAL has published more detailed statistics on Cuba’s current transfers that separate out donations, remittances, and other forms of transfers. These statistics, presumably CEPAL estimates based on information provided by Cuba’s National Statistical Office (Oficina Nacional de Estadísticas, ONE) and by the BCC, are only available for the period 1995– 2001 (Table 2). According to these estimates, over the entire period 1995–2001, donations accounted for 9.0% of current transfers, remittances for 85.6%, and other transfers for 5.4%; in 1999 and 2000, remittances accounted for nearly 88% of current transfers. Remittances rose from about 540 million pesos in 1995, two years after Cuban citizens were first allowed to hold foreign currencies, to 740 million pesos in 2000 and 730 million pesos in 2001. • Some Cuban economists interviewed by Spadoni (2003, pp. 416–7) assert that the “remittances” series refers exclusively to transactions through official channels (such as Western Union, Transcard, and other officially-sanctioned money transfer services) and exclude informal money transfers physically carried by mulas as well as by friends and family during visits to the island. A popular method of estimating remittances flows, particularly from persons residing in the United States to persons in Latin American nations, is through the use of surveys of remitters. Results of these surveys are sometimes combined with information obtained from money transfer companies to provide a broader picture of the supply of remittances. One weakness of this method is that, since it focuses on remittances senders who reside in the United States, it underestimates overall remittances flows because remittances sent from other countries (e.g., European nations) are not covered. The Multilateral Investment Fund (MIF) of the Inter-American Development Bank and the Inter-American Dialogue, a policy analysis organization based in Washington, D.C., have been at the center of much of the work conducted in the last five years to document the magnitude of remittances to Latin America and the Caribbean from the United States and to promote their expansion and constructive use in the development process. Much of the survey work involving remitters based in the United States has been carried out by U.S.-based public opinion firm Bendixen and Associates on behalf of the MIF, the Inter-American Dialogue, and other clients. A study of remittances to Central America and the Caribbean by the MIF (2002), based on a survey of remitters in the United States conducted by Bendixen and Associates, reported that remittances to Cuba in 2001 amounted to $930 million; Orozco (2002b) also refers to the $930 million estimate and states that this level of remittances was equivalent to 5% of Cuba’s gross domestic product (GDP) and 40% of the value of exports. In a paper based in part on the results of the survey underlying the mentioned MIF study, Orozco (2002a) discusses the channels of sending remittances to Cuba and posits that Cuban Americans sending remittances to the island rely more heavily on informal channels or mulas than other groups of remitters to Latin America and the Caribbean: thus, according to Orozco, 46.4% of Cuban- American remitters used informal channels, compared to 13.3% for other groups sending remittances to Latin America and the Caribbean. The author goes on to suggest, based on interviews with Cuban government officials, Cuban academics, and money transfer industry officials in the United States, that up to 80% of remittances sent to Cuba used informal channels; this is consistent with a statement to Orozco by an official of CIMEX—the Cuban government agency in charge of managing remittances—that only about 25% of remittances go through their channels (Orozco 2002a, p. 10). Orozco posits that at least 3,000 “mulas” may have been at work in the late 1990s and early 2000s, making on average 20 trips to Cuba per annum and carrying $6,000–$10,000 per trip, for a flow of remittances ranging from $360 million to $600 million. If these figures were accurate, the 60 percent drop in the number of Cuban-American visitors to the island noted above would have had a dramatic impact on the flow, although it seems certain that many mulas would have sought and found alternate routes (e.g., through Mexico and other countries) to travel to Cuba. In a subsequent report, the MIF (2004) reported remittances to Cuba in 2002 at $1,094 million. • A third of the respondents indicated that they sent money to Cuba monthly, while 48% indicated that they remitted every 2 to 3 months. • The average amount of remittance was $100. • 41% of respondents indicated that they sent their remittances through Western Union (a formal channel), 51% used other companies or travelers, and 8% used other means. Assuming 500,000 remitters in the United States sending $100 per month, “the total amount of remittances would be $600 million, slightly over half of the $1,138 million Cuba claims to receive from remittances” (Pérez Rodríguez 2003, p. 432). A much lower estimate of remittances to Cuba resulted from a survey of 1,811 Cuban-American households in Miami-Dade and Broward countries, Florida, conducted by Florida International University (FIU) in the first quarter of 2004 for the South Florida Sun Sentinel and television station WTVJ Channel 6 (Bauzá and Marrero 2004). Slightly over half of the respondents (53.6%) indicated that they sent remittances to relatives in Cuba. The average remittance per household in 2003 was $387 (recording households that did not send any money to Cuba as sending zero remittances).8 Since the 2000 U.S. population census reported that there were 269,868 Cuban- American households in the two counties, the authors of the FIU survey estimated that remittances amounted to $97 million (FIU 2004).9 If the average remittance estimate were to be applied to all Cuban- American headed households in the United States in 2000 (477,405), regardless of whether the household head was foreign or native born, the estimate would reach some $185 million. Finally, Bendixen and Associates conducted a large survey of remittances to Cuba in 2005 for the Inter- American Dialogue (Bendixen 2005). Bendixen and Associates interviewed a national sample of 1,000 Cuban-American adults in February 2005; the sample was selected using probability sampling techniques with a margin of error of +/- 3%. Forty-one percent of respondents indicated that they sent money to a friend or relative in Cuba; the average amount of a remittance was $150, the average frequency of remittances per year was 7, and 83% of remitters indicated that they used an international remittance company. Bendixen and Associates estimated that 440,000 Cuban-Americans remitted an average of $1,050 per person, for total remittances of $460 million per annum. The substance of this estimate could be questioned, however, since it is generally accepted that sending remittances is a household’s rather than an individual’s decision. Bendixen and Associates’ estimate assumes that 85 percent of all Cuban-American households in 2005 (estimated by the authors as 515,000 households headed by native and foreignborn Cuban-Americans) were sending remittances to Cuba, a rather unlikely proposition. Another approach that researchers have used to estimate remittances flows is to conduct household surveys of recipients. Although this approach has been used most commonly to learn about the characteristics of remittances recipients, how they spend remittances, and the contribution of remittances to the overall household income, it can also be used to make estimates of the volume of remittances flows. Blue (2004, p. 71) led a team of ten Cuban research assistants who conducted a household-level survey in Havana in December 2000 that, among other topics, elicited information from respondents regarding the remittances they received from abroad. According to Blue, Havana was then (in 2000), and has been over time, the origin of the majority of Cuban out migration and the destination of the majority of remittances flowing into the island. Although Blue does not make estimates of overall remittances flows in her paper, it is possible to make some very rough calculations based on her work. First, applying the rate of households in La Habana that received remittances (34.13%) to the 649,153 households that existed in the city of La Habana at about that time,13 we can estimate that 221,556 households in the capital city received remittances. Second, using the $752 mean remittance per household estimated by Blue we can calculate the amount of remittances these household received in 2000 at approximately $167 million (221,556 households times $752 per household). Third, further assuming that Cuban households receive remittances from friends and relatives abroad at a uniform rate irrespective of location, i.e., that the $752 per household remittances level estimated for La Habana applies to the entire island, and considering that La Habana has been the origin of the majority of Cuban out migration and the destination of the majority of remittances flowing into the island—as high as 60% to 70%14—we can estimate the national level of remittances for the nation in 2000 at between $240 million and $278 million. Another estimate of remittances received by remittances recipients in 1998–99 can be made using as a base a survey of then-recent emigres from Cuba conducted by a team led by a researcher from the University of Florida (Roberts 1999). The study used an availability sample of Cuban emigres that had been in the United States three months or less. In all, 1,029 subjects were interviewed from December 1998 to April 1999; 41% of the respondents were female and 59% male, 87% were white and 13% nonwhite, and 64% lived outside of the city of La Habana. Since the data did not come from a probability sample, sampling errors could not be estimated accurately, but the authors of the study posited that margins of error of about 3% would be expected given the sample size. Among many questions, survey participants were asked to indicate whether or not they received remittances and, if so, their frequency of receipt and amount (Betancourt, 2000, p. 151). About 3% of the participants did not respond to this question. Out of the total of 992 participants who did respond, 629 (63.4%) indicated that they did not receive any remittances at all;15 258 (26.0%) that they received less than $90 per month; 75 (7.6%) that they received between $90 and $100 per month; 20 (2.0%) that they received between $101 and $200 per month; and 10 (1.0%) that they received over $200 per month. Making some assumptions about the mean remittance level within each of the ranges,16 we can estimate a weighted average remittance level of $71.12 per month, or $853 per annum. Further assuming that the respondents reported household remittances—rather than individual remittances— and using the same methodology that we used above to estimate the volume of remittances for households in the city of La Habana ($853 per household times 237,589 households, for remittances of $189 million in La Habana) and nationally (expanding the estimate considering that 34% of the respondents in the émigré survey lived in La Habana and 66% in the rest of the nation) yields an overall remittances estimate of $525 million. This estimate probably overestimates remittances levels as the individuals surveyed (recent arrivals from the island) were more likely to have relatives abroad and receive remittances than the rest of the population (Betancourt, 2000, p. 151). Cuban scholars writing on aspects of the island’s socioeconomic situation and prospects have also provided estimates of the magnitude of remittances. Although in general these scholars have not documented the methodology underlying their estimates, we believe that they reflect the conventional wisdom of economists and specialists in the island. 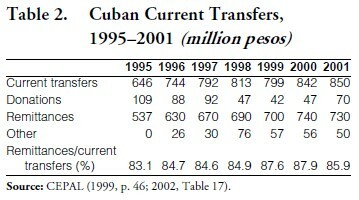 In an article published in 1999, Cuban economist Pedro Monreal (1999) recalls Cuba’s official BOP statistics indicating that net current transfers in 1996 amounted to $743.7 million, the bulk of which was presumed to be family remittances, and CEPAL’s estimate of $800 million in family remittances in that year. Monreal writes (1999:50): “Other estimates made in Cuba place remittances [presumably for the period 1995–98] in the range of $300 to $400 million … we cautiously assume that remittances fluctuated around $500 million.” Elsewhere Monreal (2003) has estimated that remittances in 2002 were approximately $500 million. Cuban economist Hiram Marquetti has been cited in a press report as estimating that cumulative remittances to Cuba were $3 billion during the period 1989–97, which is deemed by the author as a conservative estimate (“Cuban Economist,” 1999). The press report goes on to state that this would put remittances in recent years at about $333 million per annum. The latter average does not seem credible as it fails to reflect that remittances probably were relatively low prior to 1993, when Cuban citizens were first permitted to hold and use dollars, and therefore the volume of remittances since then likely were much higher than the average for the entire 9-year period covered by Marquetti’s estimate. Researchers have also used demographic and socioeconomic characteristics of remittances-sending migrants and models of remittances-sending behavior to make inferences about the level of remittances flows. Rather than being remittances estimates per se, this methodology serves as a check on the reasonableness of remittances estimates made using other methodologies. Because precise estimates of characteristics of migrants generally are not available, and there are inherent difficulties in modeling remittances-sending behavior, researchers typically have used this methodology to make estimates of ranges of potential remittances flows rather than point estimates. 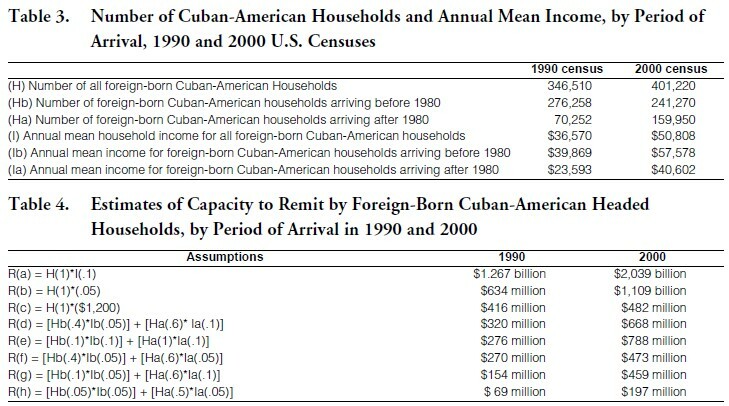 Díaz-Briquets (1994) used demographic and socioeconomic characteristics of the Cuban émigré community residing in the United States, as reflected in the 1990 U.S. Population Census, and certain assumptions regarding the remittances-behavior of Cuban- American households17 to “calculate a plausible range of remittance estimates.” In particular, Díaz- Briquets posited that the remittances behavior of Cuban- Americans (1) would differ depending on their time of arrival to the United States, with the propensity to remit of cohorts arriving to the United States prior to 1980 being lower than that of cohorts arriving after 1980; and (2) households headed by U.S.- born Cuban-Americans would have a propensity to remit of zero. Díaz-Briquets’ remittances estimates ranged from $1.267 billion (based on the highly unrealistic assumption that every one of the 346,510 Cuban-American households remitted 10% of their 1989 mean annual income) to $154 million (based on differentiated assumption regarding remittances according to their period of arrival). Díaz-Briquets concluded that the most plausible remittances levels from Cuban Americans in 1994 were in the range of $300 to $400 million. 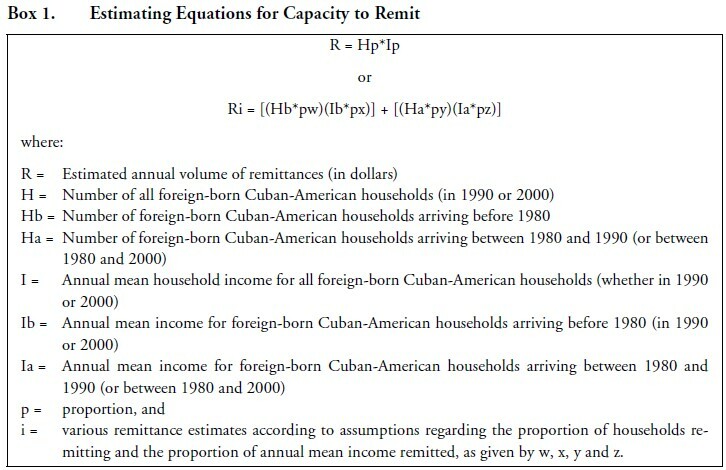 More recently, a Cuban researcher (Aguilar Trujillo 2001) used a similar approach to estimate potential ranges of remittances to Cuba from the Cuban- American community. His work also relied on the demographic and socioeconomic characteristics of the Cuban-American community in the United States as reflected in the 1990 U.S. Census of Population. He made several assumptions regarding the remittances-behavior of Cuban-Americans and estimated potential remittances levels ranging from $299.1 million to $734.4 million. Aguilar Trujillo’s estimates clustered around $300 to $500 million, a similar range to the most plausible scenario developed by Díaz-Briquets. Diaz-Briquets’ 1994 estimates are updated here with special tabulations derived from the 2000 U.S. Census and compared with previous estimates obtained from the 1990 Census.18 The same procedures and assumptions are used to make the two plausible range of remittances estimates, including that the remittance behavior of more recent immigrant arrivals (those entering the United States between 1990 and 2000) is comparable to that of immigrants enumerated in the 1990 census entering the Unied States during the preceding intercensal period (1980–1990). The estimating equations are given in Box 1, while the population and income data and the different assumptions used in performing the simulation—both for the 1990 and 2000 census years—are given in Tables 3 and 4. As can be seen in Table 3 a sustained flow of immigration from Cuba in the 1990s, reflected in the entry of several thousand “balseros” and, following the 1994 U.S.-Cuba migration accord, of 20,000 new Cuban immigrants a year, together with the effect of demographic trends, have produced considerable changes in the period of arrival cohort composition of the Cuban-American foreign-born population. Between 1990 and 2000, the number of foreignborn Cuban-American households increased by 54,710. At the same time, the number of foreignborn Cuban-American households headed by a pre- 1980 arrival declined by 34,988, a development largely attributable to the mortality experienced during the intercensal period by this entry cohort, which already in 1990 had a late median age of 52.7 years (as opposed to 38.8 years for the 1980 to 1990 period of entry cohort). Corresponding figures for 2000 were 60 and 47, with the 1990 to 2000 entry cohort having a young median age of 35 years. As the pre-1980 household headed entry cohort was being decimated by the force of mortality, the post- 1980 household headed entry cohort increased by 89,698 households, or by 128 percent. The potential consequences of these demographic shifts for the volume of remittances being sent to Cuba (assuming comparable parameters for both census years with due allowance being made for nominal annual mean income increases) are quite substantial, as can be seen in Table 4. In some cases the potential estimated amount of remittances increases by a factor of three, the potential growth rate never falling below 60%, except under the assumption that every foreign-born household remits to Cuba the maximum sum allowed under current law. By 2005 the potential amount of dollars that could have been remitted, following the logic described above, would have been even higher, as between the 2000 census date (April 1) and mid-2005, approximately 100,000 additional Cubans migrated to the United States. Assuming the average household size of new arrivals is 2.7—the average household size between the 1980 to 1990 arrivals (2.8) and the 1990 to 2000 arrivals (2.6)—nearly 37,000 new post- 1980 foreign-born Cuban-American households were added to the potential pool of families with a higher propensity to remit dollars to their relatives in Cuba. In light of the 2000 simulation results, and considering the steady entry into the United States of Cuban immigrants since then, it can be posited that the potential stream of Cuban-American remittances to the homeland increased considerably since the early 1990s. It appears reasonable to conclude that the remittances capacity of Cuban American community may well have ranged between $600 million to $1 billion a year in 2005. Remittances are inherently difficult to measure, and estimates are rife with limitations. Many issues determine the nature and amount of remittances, including economic conditions in sending and receiving countries, policies pursued by migrant-sending and – receiving countries, the nature, maturity, and sustainability of migration flows, the extent of return migration and potential for family reunification in destination countries, and the mechanisms through which remittances are sent, among many others (for a review, see Díaz-Briquets and Perez-López 1997). This could be significant in the case of Cuba. Also there is the issue of U.S. restrictions and whether those wishing to send remittances abide by the restrictions or use other means. Finally, there is the nagging question that survey respondents tend to be less than candid when responding to questions of a financial nature. 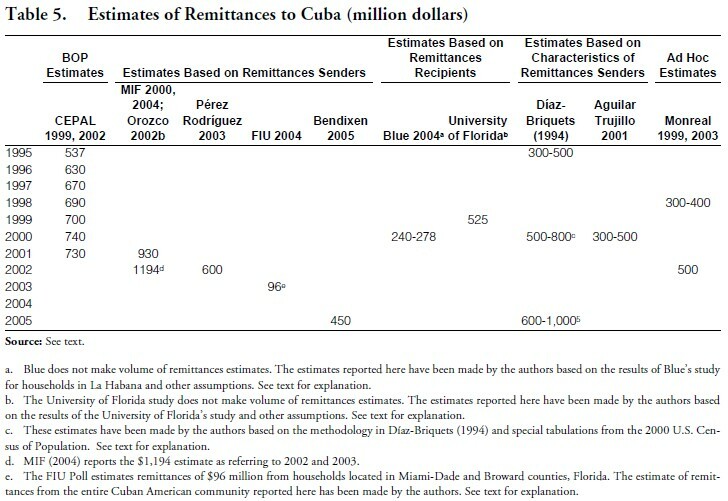 Table 5 shows the estimates of remittances to Cuba associated with the methods discussed in this paper. The first observation that can be made is the sparseness of the estimates; there are relatively few instances where two or more estimates are available for the same year, as the methods described in the paper typically have been used to make estimates for a single year. It is telling that despite the importance of remittances to the performance of the Cuban economy, it is not possible to cobble together a time series on remittances that stands up to scrutiny. Second, the BOP estimates and the estimates made for the MIF by Bendixen and Associates represent the upper end of the range of estimates. These estimates, which would suggest remittances flows approaching $1 billion per annum for the early 2000s, are generally quite higher than those associated with the other methodologies, two to three times higher than other estimates that seem to group around $300 to $500 million. The estimates of capacity to remit we have made for 2000 and 2005 would support even the high-end estimates of remittances levels. Third, the non-BOP estimates focus exclusively on remittances flows from Cuban-Americans, and exclude altogether remittances flows from the expatriate Cuban community in Europe, in the rest of Latin America, and in other locations. Considering the steady emigration from Cuba to these locations historically, and the rise in recent years, particularly to Spain, the remittances estimates based exclusively on U.S. residents probably significantly understate actual remittances flows into the island. To conclude, the quantity and quality of estimates of remittances to Cuba are poor. To some degree this results from the opaqueness of the Cuban statistical system and its failure to disaggregate balance of payments statistics so that remittances flows may be identifiable. It is also the result of lack of attention to this issue by the research community abroad and the lack of funding to conduct the large-scale surveys that would be necessary to make overall remittances estimates. The Cuban government’s restrictions on conducting survey research on the island compound this problem. 1. The authors are grateful to Benigno Aguirre, Ernesto Betancourt, Sarah Blue, and Omar Everleny Pérez Villanueva for data used in the paper and to Ernesto Betancourt also for comments on an earlier draft. 2. In addition to these money transfer companies, there are myriad organizations advertising in-kind remittances to Cuba, such as packages of goods and pre-paid purchases from state-owned stores of electric appliances, clothing, personal hygiene products, food, etc. This paper focuses on money remittances and does not address the larger issue of overall transfers to the island including in-kind remittances. 3. In October 2004, the U.S. Treasury Department barred U.S. nationals from using the services of SerCuba to remit cash to Cuba because it determined that SerCuba operates under Cuban law and it is supported by Cimex S.A., a government-owned trading company (Bachelet 2004). 4. The report argues that the Cuban Government captured a portion of the remittances through transfer fees levied on activities of licensed U.S. remittance companies, charges to unlicensed remittance carriers (“mules”), and sales—at very high prices—of goods and services at state-controlled dollar stores, Tiendas de Recaudacón de Divisas. 5. This section draws on Pérez-López (2000). 6. The most recent issue of the Cuban statistical yearbook, for the year 2003 (AEC 2003), only contains BOP statistics through 2001. 8. These results do not differ very significantly from those obtained from a small, non-representative sample of respondents in the Miami area (55 oral surveys and 48 written surveys) conducted presumably in late 2003 or early 2004. Of those informants approached, 66% claimed to send to Cuba $700 or less a year (Spiegel 2004:67). 9. Applying the 95% confidence interval (single sample t-test), 95% of the time the survey were repeated with the same population, the average household remittance would fall between $322 and $452, corresponding to total remittances of $81 million to $113 million (FIU 2004). 10. Orozco (2005) has reported on a survey of 200 remittances recipients in Cuba. The survey yielded important information on characteristics of remittances recipients, frequency of receipt of remittances, source of remittances, relationship between remittances senders and recipients, and so on, but did not provide estimates of remittances flows. 11. Snowball sampling is a special non-probability method used when the desired sample characteristic is rare, or in this case, when random sampling is not possible. Snowball sampling relies on referrals from initial subjects to generate additional subjects. While this technique can dramatically lower search costs, it comes at the expense of introducing bias because the technique itself reduces the likelihood that the sample will represent a good cross section from the population. http://www.statpac.com/surveys/sampling.htm. 12. The mean of household remittances receipts, which is not reported in Blue (2004), was provided to the authors by Professor Blue. We are grateful to her for making this key information available for this paper. 13. This information was provided to the authors by Omar Everleny Pérez Villanueva of the Universidad de La Habana. We are grateful to Professor Pérez Villanueva for providing us with this key statistic. 14. Rodríguez Chávez (1997a, p. 20) states that 65.3% of migrants from 1985 to 1989 resided in La Habana. Montiel Rodríguez (1996, p. 264) has reported that 60% to 70% of Cuban migrants in the 1990s resided in the city of La Habana. 15. This means that about 37% of the respondents received remittances; note the similarity of this result with the 34% in Blue’s survey. 16. We have assumed mean remittances of $45 for those receiving less than $90 per month; $95 for those receiving between $90 and $100; $150 for those receiving between $100 and $200; and $400 for those receiving over $300. 17. As defined by the origin of the household head. 18. The authors gratefully acknowledge the contributions of Daniel J. Perez-Lopez and Jason Ost in preparing special tabulations based on the 2000 U.S. Census.